Part-time green tea collector and author of the WEIGHTING TO LIVE series. I shan't do my usual lengthy explosion of words and instead I will simply say that since my last post three weeks ago, I have basically been working before and after the day job on the short story I started writing on New Year's Day and briefly mentioned in my last post... that I have only gone and finished, so I am pleased to announce that Just Julia: a short story about eczema, is available worldwide on Amazon NOW! 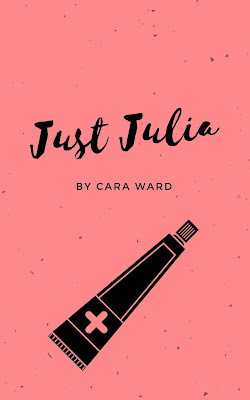 I made the cover on good ol' reliable Canva to compliment the other two short stories I have previously self-published and I could be effusive and soppy about the website but I will just say that I BLOODY LOVE CANVA. So yeah, my life in the last three weeks has been made up of editing like a madwoman, a casual bit of burnout and anxiety and much excitement as I'm really happy with how it turned out. They say to write what you know, and I think it's safe to say that I know eczema. I was first diagnosed with it at six months old and suffered from it all the way up to my teens when the other delightful condition, red skin syndrome came into my life and blurred all skin condition lines. So I've pretty much had to think about my skin more than the average person for well over twenty-five years of my life. I don't think those who haven't suffered from a chronic skin condition realise that it can be a trauma and I found the experience of writing Just Julia immensely helpful in closing a door on another tough part of my life. Can Julia reclaim her identity from her skin, or has she finally given up? From the author of Curing my Incurable Eczema and the Weighting to Live series. The links to buy it are in the 'Books' section of this blog. I shall leave it there for now as I sense a hint of burnout is close at hand. Yay. Again, I have no recollection of when this happened but randomly one day when I had 5 minutes where I was on hold to a callcentre at work, I ended up writing 624 words of an update chapter that I'd like to include in the back of my book, Curing my Incurable Eczema. Due to the nature of the book and my skin story, I do believe it's so important to be completely honest and discuss any changes mentally or physically I might experience. I want to be an open book (URGH). My anxiety in the time since I first self-published it has taken a bit of a nosedive and a large reason for that is pushing myself a little too hard. I will never learn but I will keep trying because that is all I can do really. Anything but give up.... but more on that later. Oh yeah, I almost forgot... on Friday 22nd March I had YET ANOTHER idea for a short story and in the space of 5 minutes whilst waiting in a queue at Barclays, I wrote 241 words of it. Could be nothing, could be something. I will definitely try and work more on it at some point in the future when I have more time. So never in a nutshell. Now, onto two books I have to discuss that are quite possibly as different as two books can be but nevertheless, equally as wonderful. I read the non-fiction book, Hamilton: The Revolution after wanting to get more background on a musical that has pretty much taken over the world. I have recently become obsessed with the soundtrack so it seemed like a no-brainer to read this book, and I'm so glad I did. The book felt like a giant hug and was not only beautiful, but so fascinating. Hamilton: The Revolution takes you from the conception of the musical all the way through to the curtain call on opening night, interspersed with the lyrics of every single song in it which has annotations in the margins from the genius that is Lin, the show's writer, offering a little glimpse into his mind and how and why he chose some of the brilliant lyrics that he did. The other book I read was Lanny by Max Porter. I shall hold my hands up and say that I only bought this book on some wild impulse when an email from Foyles arrived in my inbox saying I could buy a first edition of a book (and author) I had never heard of before... but if I was one of the first 100 people who bought it, I would receive a LIMITED EDITION SIGNED print. Words too tempting to resist. Fine, I confess, I don't think I even knew the synopsis before parting with my cash but I ended up being pleasantly surprised as it turned out to be one of the most beautiful and unusual books I have ever read. I went into it not knowing what to expect and on reflection, with a book like this, I'm so glad as it was the best way to go into it. Quirky and divine and cosy and funny with glorious sentences pieced together to form this joyous hardback. I don't want to even give away a single thing about the story or language so you can experience it as I did. Jump in at the deep end and prepare to be spellbound. And finally, I thought I'd end this lengthly update by sharing two pieces of news with you all and a little bit of corny reflection. On 18th March, a podcast with the lovely girls from Mental Health Book club Podcast that I recorded back in January was put up then the following Friday 22nd March, a documentary I was part of all about the skin condition I suffered from was released (here) and between both projects, they put me in a very reflective mood. I started to think a lot about my life and the many strange and tough times there have been, then how much my life has changed. It made me think about my skin in particular and how, over the course of two years where I was housebound and in a lot of pain both mentally and physically, I was able to change my life completely and along the way find a love of writing. More importantly, for the first time in my life, I didn't give up and in the last month where I have had moments of doubt wondering whether all this sacrifice and hard work I have put in with writing is worth it, I would think about my skin and how I didn't give up and ended up with the best skin of my life. None of us know what will happen, which is terrifying but also wonderful. Don't give up. Three simple but strangely hard words that have changed my life. I did exactly as I said I would in my last post and actually took some time off. On 1st February I went to my Mum's and basically switched off for three and a half days, watching every episode of Luther in existence, and came back the following Monday. As I had time off work till Wednesday, I just chilled at home until suddenly, on Tuesday 5th February, something switched and I was ready to begin work again on my writing projects. I felt focused, refreshed and very excited as I knew exactly what to do. January in a way felt at times like I was only going backwards when in reality, I was always going forwards: I began editing (with gusto - don't you just love that word?!) the BIG project, I wrote from scratch two short stories I wanted to that I'm so pleased with, edited Bryan Trout whilst tackling a severe bout of anxiety and had a full time job which was intense at times to say the least. Not bad. I was back on track and ready to actually do things a little differently... of course well over a week has passed and that 'do things healthier' motto is all but a dream, but I'm better -at least I hope so- and know I can never do that to myself again. As per, I've slightly deviated from what I was saying, so getting back to Tuesday 5th, I ended up basically starting and, pretty much finishing, the cover for The Dissection of Bryan Trout (below). The following day, for an hour before work, I read through Bryan Trout, highlighting parts I wanted to go over and/or change then after work for a couple of hours, working on those highlights whilst also cutting bits I'd tried to make work in the past but couldn't and read it through once more feeling very satisfied with what I had done. I also made the finishing touches to the cover. I think essentially, on that Tuesday, I realised that I was faffing too much and needed to just get on with it. 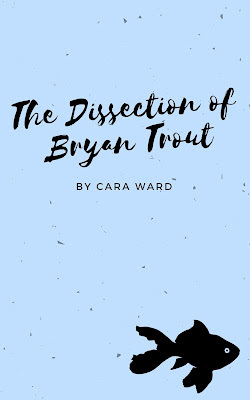 I knew Bryan Trout was close to being done, so I did it and could see things clearer because I gave myself the time switch off and recover.. Over the following few days I basically concentrated only on that story with the goal of publishing today, which I've managed to do. It's lovely when you end up being able to do exactly what you'd planned to. Also, I haven't been eating sugar, and have looked after myself a bit more and am wondering whether that has helped me see things more clearly too... on a side note, I am currently craving scones an inhuman amount. Send help. Who are you Bryan Trout? Bryan Trout is an exceptionally dull man, or so he thinks, with a rather unusual name. A short story about self-discovery, change… and a goldfish called Brian. From the author of Fancy That and the Weighting to Live series. Oh, and another thing, did I mention that IT'S COMPLETELY FREE TO DOWNLOAD FOR THE NEXT FEW DAYS?!!? Visit the BOOKS tab to download your FREE copy today! Right, that is quite enough for now. I'm off to look at pictures of scones... and you think I'm joking. © 2017 Cara Ward. All rights reserved. Simple theme. Powered by Blogger.